Every year with Remy was special, but his last year was especially so. 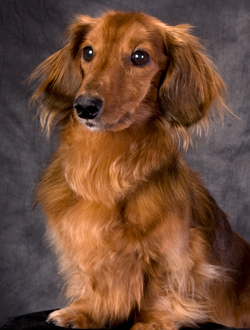 Remy turned 12 on 30 October 2009, celebrated his 13th birthday in October 2010, and died on 21 December 2010. 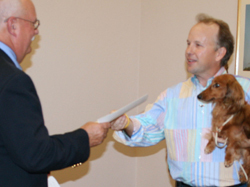 On the last day of 2009, Remy earned his PAX2 title in Phoenix, AZ. We drove from southern California and arrived at the trial site that evening just in time for Remy's runs. He qualified in both STD and JWW for his 40th double-Q in Preferred. We took the photo with judge Ann McQuillen the next day. 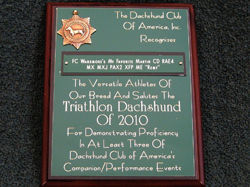 In January 2010, the Dachshund Club of America national field events were held in southern California. The most special part of this week was Patt Nance bringing Olive out from Ohio to compete in DCA Tracking (they passed) and to see if she should join our family (she did!) 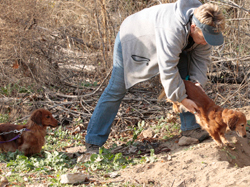 Remy competed in field trials and earthdog, and passed Master Earthdog for the final time in his long and successful earthdog career. 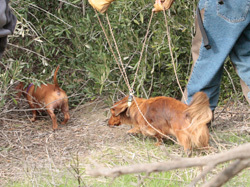 Remy and Charlie are released on the line at the DCA Field Trial. 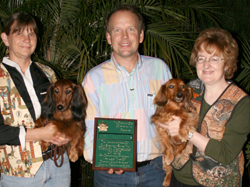 Charlie and Remy ran together many times as Open Dogs and Field Champions. 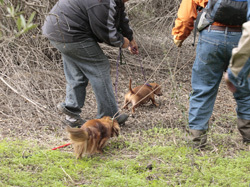 Remy and John on the Master Earthdog hunt. Remy indicates the den entrance. Following his successful run in the tunnel, Remy watches as Cris Baldwin releases Sawyer. Remy "honors" while Sawyer works in the den. 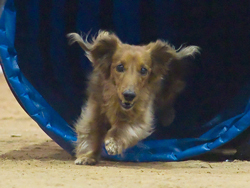 Sawyer was our inspiration for getting started in agility. 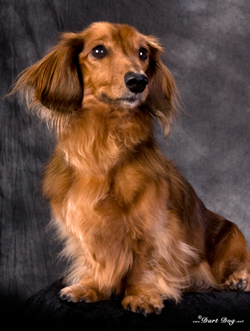 Remy qualified for and competed in the AKC National Agility Championship in March 2010, the first time Preferred dogs were eligible to compete at the Nationals. Remy ran clean in 5 out of 6 runs over 3 days. He didn't knock a single bar but took a tunnel trap on one course -- it was his only mistake but it kept him out of the finals. Remy finished second in the 4" class in the State Tournament and seventh in the National Championship tournament. In this video of Remy competing in the Challenger Round you can hear the announcer reading his bio in the background and the audience cheer when Remy gets over the a-frame. 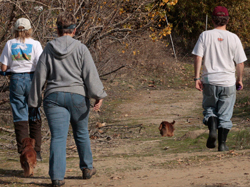 This was our last big trip with Remy and we all really enjoyed it. In September, Remy started coughing again and we thought it might be a return of his pneumonia. But he was diagnosed with a lung tumor. 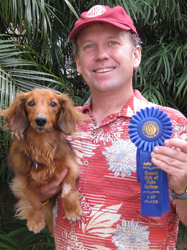 As we prepared for hosting the agility, obedience, and rally events for DCA 2010 in Riverside CA, we didn't know how much longer Remy would be with us and if he would even be able to compete. 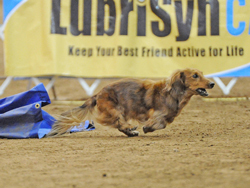 Temperatures soared on the day of DCA Agility and we started the trial after sunset in a "cool" 107 degrees. 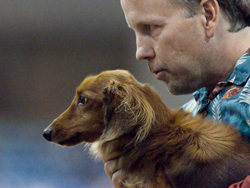 Remy delivered a beautiful performance on the Standard course and won his fourth DCA Agility High in Trial. To our surprise, Remy was in the running to win the Triathlon on the final day of DCA Rally. We were all tired and it had been a while since Remy and Diane had competed in rally. 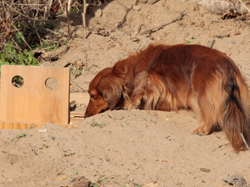 But Remy did a great job and qualified in Excellent B in second place. We brushed and groomed Remy and John showed him in Triathlon Conformation. 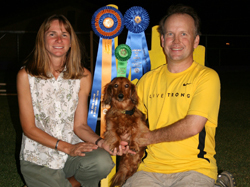 With these points and his scores in Master Earthdog, Agility, and Rally, Remy was the co-winner of DCA Triathlon Dachshund of 2010. This video celebrates Remy's performance in the DCA 2010 Triathlon. Winning the DCA Triathlon was one of our lifetime goals, and for Remy to win it at age 13 was very special. Before leaving the Riverside Convention Center that night, we decided that since Remy was groomed and looking nice, we would have one of the professional photographer take some photos. Remy did a great job posing and we got some wonderful photos from Dart Dog. After a series of tests, we decided that Remy should have surgery to remove the baseball sized tumor in his lung. He was having difficulty breathing but was clearly still a happy and active dog. 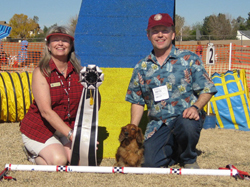 Remy earned his final agility ribbon (another first place) in Excellent B Preferred Standard on 6 November, a few days before his surgery. The surgery was performed on 11 November, went well, and the prognosis was good. It was major surgery and Remy had a significant recovery period. 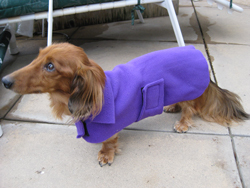 He was shaved over much of his body and we made and bought several fleece coats for him to wear. But as always, Remy was cheerful and happy. 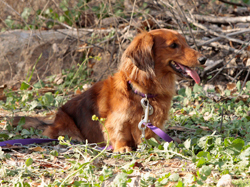 Remy's recovery seemed to be going well and he went to obedience class with Diane in mid-December and was happy heeling, retrieving, and doing recalls. 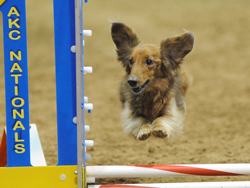 He competed in his final agility trial on 19 December and completed the Excellent JWW course. He was clearly tired -- over time and knocking a few bars -- but otherwise looked good. The moon bled and the sky wept to honor the passing of Remy, FC Wagsmore's My Favorite Martin CD RAE4 MX MXJ PAX2 XFP ME W-BBFD-MF (October 27, 1997 - December 21, 2010), at age 13. The next day, shortly after sunset, Remy had a terrible nosebleed and we rushed him to the vet. 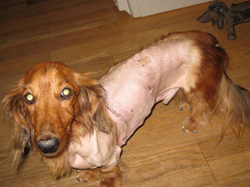 His cancer had returned and was ravaging his entire body. Remy had fought through many crises but clearly the fight was over. At 2:00 am on 21 December we gave him a few last pieces of cheese, told him how much we loved him, and he died in our arms. 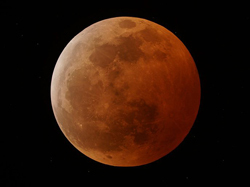 The night of 20-21 December marked a rare lunar eclipse at the winter Solstice. 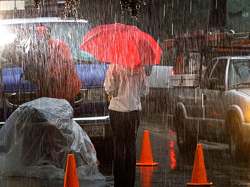 We didn't see the lunar eclipse in southern California -- it started raining that night, and poured for days. Rain in southern California the night of 20 December 2010. Click here for "Remembering Remy"